This page contains a sampling of how you can use available universal and common parts on our Scooter Parts Page to retrofit, upgrade, or replace parts on your unsupported electric scooters. We welcome comments and advise from customers who have sucessfully made alterations to utilize our available parts for upgrading and repairing other brands of electric scooters. This feedback will help many others. The fact is that there is little parts and service support for most scooters sold on Ebay and over the internet, or even in many shops offering an assortment of items like skateboards, push scooters, and electric scooters. We welcome your help that will assist others. You can always post to our forum. Include as much detail and pictures as you can and we may also include your information here. No information or part is guaranteed to work with every scooter, however, and we caution anyone attempting an upgrade or retrofit to only use alternate parts at their own risk for the desired results. We do not accept returns, exchanges, or provide refunds or credits when parts are used for other than exact replacement on our Vapor, Rad2Go, or X-treme scooter models. Parts purchased in error or that do not work for your application are not returnable. That being said, scooter parts are pretty easy to work with and it is not brain surgery. There is a certain degree of ingenuity sometimes needed, however, for many who attempt to boost the performance of their scooters, or just make them work again when they are broken. Yet, most upgrades and repairs are as easy as unbolting and rebolting a component, cutting wires and splicing in a new component. Have fun and good luck with your projects! Most scooters use the same type of 7/8" diameter handlebar twist grip 'Hall Effect' throttles* (gives it the power using a right hand control), hand brake lever (stops the scooter by using a cable to attach to the band brake drum and two wire harness to the controller to cut power to the motor), 70mm/80mm/88mm band brake drums or the newer cam type 88mm brake (on the rear wheel which squeezes against a brake hub to provide braking), and motors that have four screw base brackets for attachment or mount via chassis mounted band clamps. Most of the difference in control boxes is in the connectors used to attach to the controller. Components may be able to be adapted to your particular situation by splicing the wires to your existing cables with connectors. There is so much variation in scooter components that it almost becomes very necessary to use existing parts since exact parts are not available. We can only provide parts which are available in these pages of our website. And, we cannot ascertain that all parts we carry for our electric scooter brands and models will properly fit other brands and models. We expressly do not warranty or acknowledge the use of parts for other brands and models than sold here. * It is noteworthy that in older scooters the throttle used a potentiometer which was usually 5K ohms. They often became 'dirty', losing contact inside and failed at the dirty spots inside, causing intermittant control of the scooter. The Hall Effect throttle uses no contact points and therefore will not fail unless broken due to impact during a fall which damages the twist grip portion of the throttle. For this reason almost all new scooters use the common Hall Effect twist grip throttle. The controller card or unit is the brain of the scooter. The throttle, brake, battery, switch, motor, and even the indicator and brake light and more will connect to the controller. It is the heart of the electrical system, and therefore the force that makes the scooter stop and go when you provide input via the throttle or brake lever. 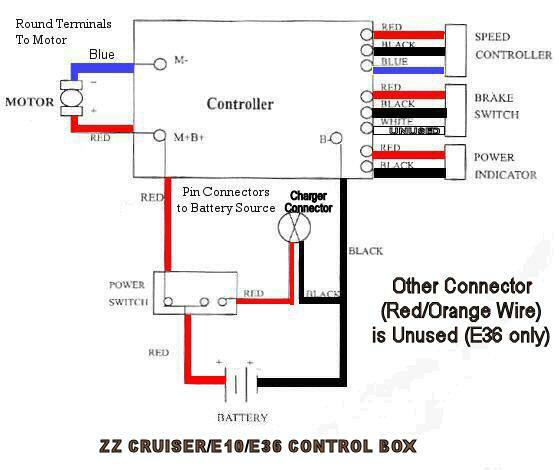 When you turn on the switch it provides power to the controller so that its circuitry can provide or cut power to the motor according to how much or when you indicate. In some cases the controller will ease the current flow to prevent overheating and possible failure and damage. The controller will also prevent the motor from being powered while the brake is applied, easing the strain on the system and providing a quicker stop. 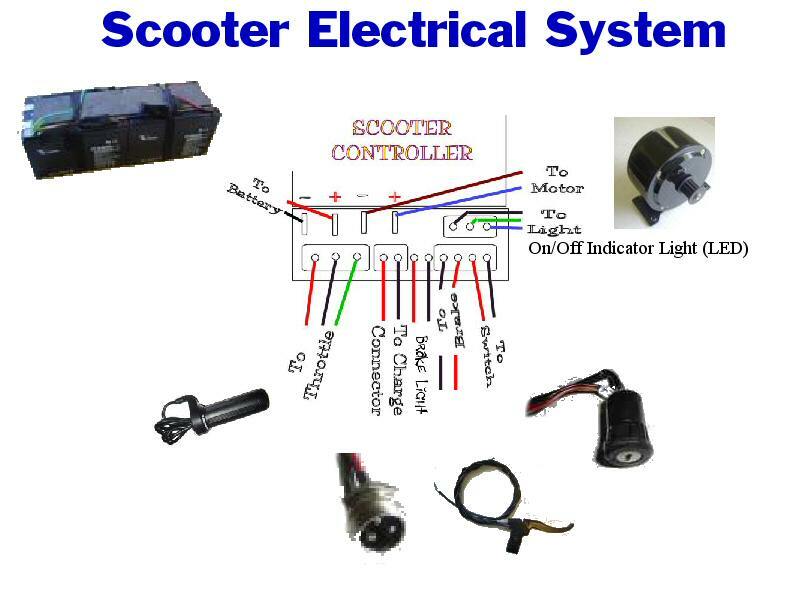 All these functions occur in similar fashion on all electric scooters, yet the controller may look much different from brand to brand, and the controller may be light duty, or heavy duty, depending on the size of the motor. The larger the motor wattage, the more current it will draw from the battery through the controller. Motors can be interchanged to the extent that a 160 or 200 watt motor can usually be replaced with a 300 watt motor without changing the controller, and the motor mounting bracket is usually the same size - Picture. Go to a larger (400-600 watt) chain drive motor, if it will fit, and you will need a heavier duty controller to supply the current to the motor. And there are 350 to 800 watt motors rated at 36 volts and requires a 36 volt control box and batteries. Most larger motors do not have brackets on the motors and they are chain drive. They install in a different fashion with brackets/bands on the scooter chassis to hold them in place. Since they are larger, you must consider how much space is available for installation/adaptation to your scooter. We provide motor diminsions on our motor page. Motors can withstand greater voltage application for short periods of time. Overheating can occur and possible burn out if motors are overstressed due to long duration use and application of voltages beyond their ratings. But higher speeds can be obtained with reasonable use. Motors can also operate with less voltage without significant loss of performance, depending on the motor and application. One of our customers has shared some very nice information about HOW TO REWIND YOUR SCOOTER'S ELECTRIC MOTOR. Not only will you learn how to rewind a motor, you will find that if you do you can improve the performance of the motor and probably make it more durable and burn-out proof in the process. The author's own 280 watt motor was rewound with wire of better insulation to improve the durability, but he also added extra turns to the windings to effectively make the motor perform like a 350 watt motor. The torque of the motor increased, and as an extra benefit the speed also increased. The author is also experimenting on ways to effective cool motors to make them less likely to burn out. Good reading and documented with pictures and CAD drawings. Most scooters come with belt or chain sprockets that provide a 1:5 gear ratio. The motor gear may have 12 teeth and the rear wheel gear may have 60 teeth. This does vary with scooters, however, and some rear chain sprockets have 80 or more teeth. Some scooter owners will increase this ration when they can find the appropriate gear and increase the speed, while decreasing the torque or acceleration. Most chain drive scooter use either a #25 or #35 chain. Rad2Go and Xtreme scooters use #25 chains. Most belt drive scooters use a metric size belt with a pitch of 5mm, while some small scooters use a pitch of 3mm (small teeth) with a HTD designation with a round top tooth. And some scooters use non-metric belts with flat top teeth that have a XL designation. See our belt chart for more information at http://www.scootersupport.com/beltchart.htm. Wheel size is also another means of increasing speed through the drive ratio. Replacing, for example, an 8 inch 200 X 50 rear wheel with an 8 1/2 inch rear wheel or larger yields more speed. Bear in mind that most 8 inch rear wheels use belts, however, and larger wheels have chain drive sprockets. If you are changing the motor anyway then go to a chain drive motor and rear wheel for less maintenance needs since belts are not as durable on 300 watt or larger scooters due to the torque. Belt teeth fail and the belts break with larger motors. In all cases you must be certain the control box is matched in wattage to the motor to prevent a burn out. The control box is the work horse, supplying current to the motor. The more you demand of the motor, the more you demand of the control box electric circuitry. 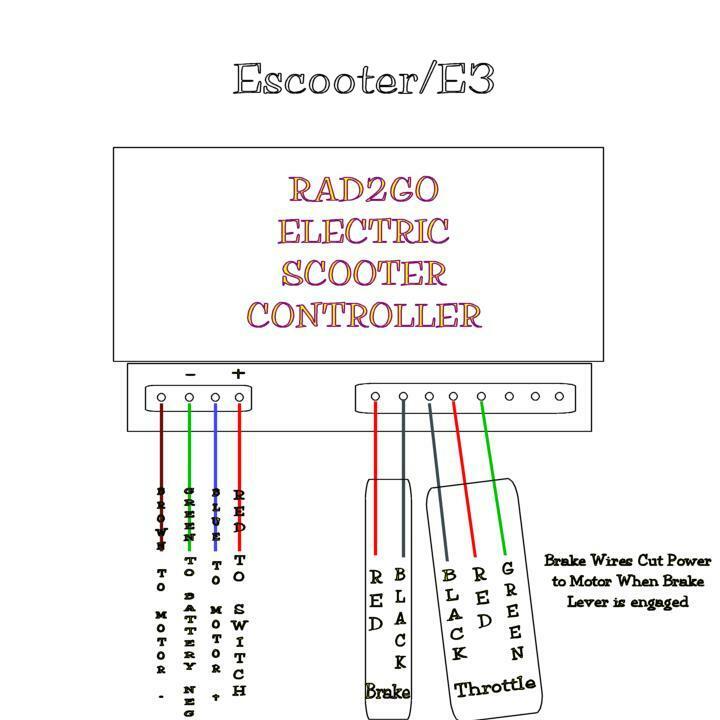 Some control boxes, like the Rad2Go types, have protection to shut down the scooter when the control box begins to overheat. It is better than burning out a controller due to circumstances like climbing hills, running through long areas of drag (like grass or dirt), or riding way too long without time to cool down.